New! The recommended websites for this book have been updated to include new video clips, virtual tours and much more. Please note, we have recommended links to video clips from the TrueTube website. This site asks you to register to view their video clips. Registration is free, but children, please ask a grown-up first. A thought-provoking book which offers a balanced exploration of the beliefs, history and customs of the major world religions, as well as many lesser-known faiths. Beautiful photographs and engaging illustrations, maps and diagrams complement the informative text. With internet links to recommended websites to explore the beliefs and practices of each religion in more detail. 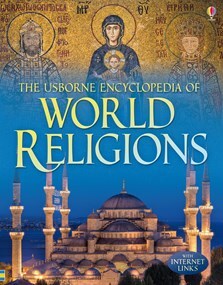 This beautiful guide includes information on religions around the world. An excellent reference resource for children, it is highly accessible, combines printed material with excellent illustration, photographs and reviewed Internet links encouraging readers to improve their research skills and deepen their levels of understanding.